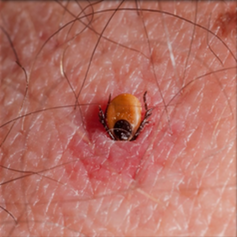 Although most ticks merely cause minor irritation when they bite, some ticks may also serve as vectors (transmitters) of diverse infectious agents that may result in disease. Lyme disease (caused by a bacterium, Borrelia burgdorferi) and transmitted by deer ticks, is perhaps the best known of the tick-borne diseases in the U.S. Depending upon the region of the country, the deer tick may also transmit the microbes that cause human babesiosis (a malaria-like infection) and human anaplasmosis (another bacterial infection). These diseases are specifically associated with deer ticks; most other kinds of ticks cannot transmit these particular microbes. Similarly, the agent of Rocky Mountain spotted fever (yet another kind of bacteria) is transmitted mainly by dog ticks and the Rocky Mountain wood tick, and also by the brown dog tick. Hence, it is important to know the identity of any tick that may have fed upon you. We can identify your tick (or good digital images of it) to offer insight that may be important to you. More information on the services available from IdentifyUS is provided on the pages of this website. The age of the tick is important when considering risk of infection. Larval deer ticks (the stage that hatches from the egg) are not born with the infection that causes Lyme disease. They must acquire that bacterial infection by feeding upon an infected animal (usually a mouse). Once infected, the tick can later (as a nymph or adult) transmit that microbe. Accordingly, larval deer ticks pose essentially no risk of infection with the agent of Lyme disease, but they may pose significant risk in their nymphal and adult stages. Hence, it is important to know the developmental stage of any tick that has fed upon you. We can assess the tick (or the images you submit of that tick) to alert you of the tick’s developmental stage. Refer to the images of deer tick life stages to better appreciate the size differences. 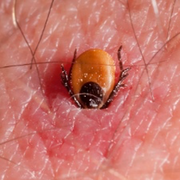 The duration of tick attachment and feeding is often critical in assessing risk to the person. For instance, a deer tick infected with the agent of Lyme disease is not likely to transmit that infection until it has been attached for nearly two days. This means that removing the tick early in the feeding period can dramatically reduce your risk. We can often assess the duration of attachment of the tick from a specimen you submit for evaluation. This information may be useful to you and to your doctor. 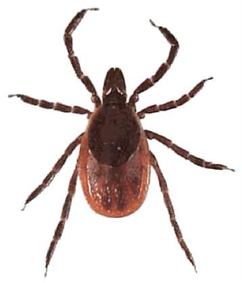 To have your tick specimen evaluated by us, follow this link to our Specimen Evaluation Form. Read and follow the directions for submitting your sample to IdentifyUS. Please note that IdentifyUS does not test ticks for infection ourselves, but we do partner with laboratories that offer tick testing services. Upon request we will forward any tick submitted to IdentifyUS to a lab that we partner with for testing purposes. Such tests add delay and cost, and the results are not always of immediate value when needing to make a rapid decision on whether or not to treat for possible infection. Samples sent to us are considered for entomological (acarological) identification, and are not regarded as clinical laboratory specimens as part of our identification process. Always consult with your physician for medical advice and diagnosis. Refer to the tick testing section of our web site for more information.